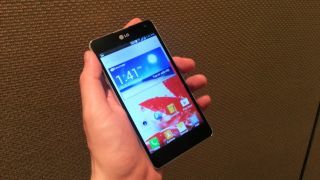 The LG Optimus G has finally made its way to Europe, but it could be too late for this 4G smartphone to succeed. LG launched the Optimus G in Korean and then the States last year, but has only just got round to bringing it to Europe now. It does come with a Jelly Bean trump card though, with the same handset in other regions still running Ice Cream Sandwich. The Optimus G also offers up a 4.7-inch HD IPS display, 1.5GHz quad-core processor, 2GB of RAM, 32GB of internal storage, 4G connectivity and a range of enhanced user interface features. They enhancements include QSlide which allows you to use multiple apps at the same time, much like Samsung's multi-window option, and you can also have a video playing or other set apps in a smaller window - much like the Pop-up Play feature found on the Galaxy S3 and Galaxy Note 2. The timing seems all the more odd considering the firm has just announced its natural replacement in the LG Optimus G Pro, which we expect to see in more detail at MWC 2013. LG has confirmed that the Optimus G will make its European debut in Sweden at the end of February, after which it will head to other markets including France, Germany and Italy. TechRadar contacted LG about availability in the UK and a spokesperson for the company told us: "We don't yet have further information regarding the availability and ranging of the Optimus G in the UK."